Unfortunately, one the of confusing things when it comes to Office 365 is that way that certain SKUs are licensed and made available via different channels. One of those that I recently struck was when there was a need for additional SharePoint Online storage space for Team Sites (not OneDrive for Business) with an end user who had a Mid-sized (M) purchased under Open licensing. Out of box currently with Team Sites you get 10GB + 500MB per user. Thus, on an Mid-sized (M) for 10 users you’ll get 10GB + 10 x 0.5GB = 15GB in total. However, what happens if you need 20GB say? That is, an additional 10GB. The way you purchase additional products is that you simply go into the Office 365 Administration portal and then elect to buy more options. When you do you’ll see the above information. in this case you select to pay with another option and proceed. 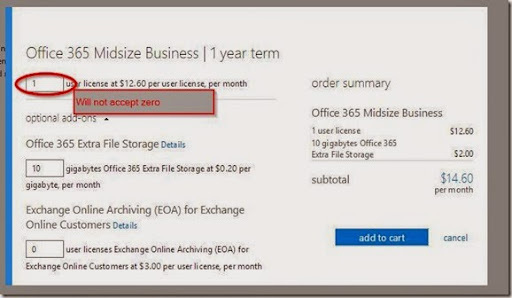 Since you already have a license (in this case Mid-sized) you would think that you select this as there is no option just to purchase additional SharePoint online space by itself. Here you see the option for Extra File Storage, however the issue is that you can’t just purchase the storage you also have to purchase an additional Mid-sized license! After some research, it turns out that Extra File Storage is not an SKU that is available via Open licensing. Thus, the only way that it can be purchased is by using the Office 365 console and purchasing it via a credit card (this is known as a retail license). However, the problem with that is that you can’t just purchase Extra File Storage by itself, it is actually only possible if you purchase a plan that includes SharePoint Online. This then means to get an extra 10GB of storage in case there is need to also purchase an additional Mid-sized business plan. The problem arises if there is no need for that additional Mid-sized license. You can’t also easily adjust the initial licenses purchased via Open because these are done on yearly basis. So you effectively end up with an additional license you may not have use for simply to obtain Extra File Storage. Many businesses will in fact use that additional license down the track so it will generally not be wasted but now you also have a tenant that has both retail and Open licenses. You have a tenant with potentially varying license expiry dates. In short, a lot of complications have been added just for the simple need of some Extra File Storage. This now means that licensed purchased under Open need to be done with careful consideration for the amount of space required in Team Sites, because if you need more than the initial licenses provide you need to purchase one less under Open and then purchase one via retail WITH the additional space you require. That really isn’t the best solution but at this stage it appears to be the only one available. 2. Increase the initial amount of allocated SharePoint Online Team Site space from 10GB (+500MB per user) to 1TB (+1GB per user). Until then, beware of using Open and having the requirement for more file space that is provided initially. If you need more, you will have to look at splitting your license purchases between Open and retail.